Right Path Addiction Treatment Centers are excited to announce we are now accepting VA Medicaid for services at our participating offices. In most cases, VA Medicaid will cover the entire cost of your treatment including your meetings with your physician, your medications, and all of your required counseling. Although Right Path cannot help with the application process, the information below will help point you in the right direction. Information and phone numbers of who you will need to call are all listed on this page. Medicaid is the state and federal partnership that provides medical coverage to eligible needy persons. The purpose of Virginia Medicaid is to improve the health of people in Virginia who might otherwise go without medical care for themselves and their children. In order to qualify for this benefit program, you must be a resident of the state of Virginia, a U.S. national, citizen, permanent resident, or legal alien, in need of health care/insurance assistance, whose financial situation would be characterized as low income or very low income. You must also be either pregnant, a parent or relative caretaker of a dependent child(ren) under age 19, under age 21 and in foster care, adoption assistance or a nursing facility, blind, disabled, or be 65 years of age or older. The Medicaid income limits are different, depending on which group of individuals you fall into. There is no enrollment fee or premium for Medicaid coverage if you are eligible. Low co-pays are charged for some Medicaid services. The graph below is a quick reference guide to help you decide what health care benefits you or your family may qualify for. It shows what coverage options are available by program and by income. 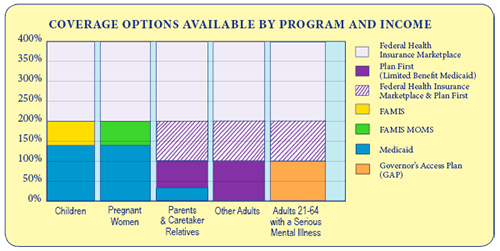 The numbers on the left side of the graph show the upper percentage limits of Federal Poverty Level (FPL)* for each program. *The set minimum amount of gross income that a family needs for food, clothing, transportation, shelter and other necessities. In the United States, this level is determined by the Department of Health and Human Services. FPL varies according to family size. The number is adjusted for inflation and reported annually in the form of poverty guidelines. Public assistance programs, such as Medicaid in the U.S., define eligibility income limits as some percentage of FPL. Individuals or families may apply for Medicaid online or through their local Department of Social Services. Aged, blind, disabled individuals, or married couples may apply for Medicaid online by using CommonHelp. Paper applications may also be downloaded. Families applying for their children may download the Health Insurance for Children and Pregnant Women form. Paper application forms may be mailed or taken in person to the local Social Services office.